May 14th is Apraxia Awareness Day and so I thought I would use this opportunity to share a little bit about the diagnosis in our family. When special needs show up in our kids' lives it can be scary and lonely and so I tell our story in the hope that it will help other moms. I am in no way an expert but I share this because I had never heard the words before my son's speech therapist suggested it to us almost four years ago. I hope this post will be helpful to those people who meet or already know our son along with any other family who may have or already has a member with this diagnosis. Now JF had a traumatic birth and spent seven weeks in the NICU. During the first months of his life he was pulseless for over an hour, had several seizures, was intubated, had several surgeries, and went through various other procedures. 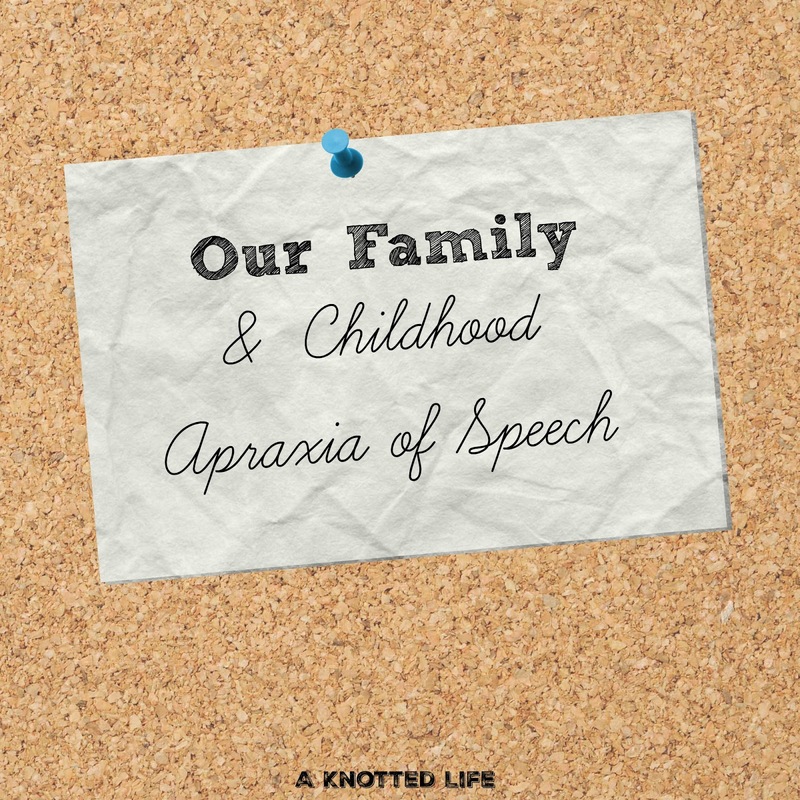 That's a lot for a little body to handle and any of those things or the sum total of them are likely to blame for JF having childhood apraxia of speech. However, it is also possible that he could have had a perfectly normal birth and trauma-free infancy and still have apraxia. 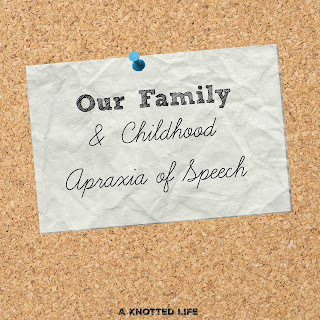 There is no known reason for apraxia in up to a third of the children who have it. But maybe I'm getting ahead of myself. What is apraxia? Well, it is a speech disorder where the person has trouble saying what they want to say. A person with apraxia understands language and even knows exactly what words they want to use but for some reason there is difficulty forming the words and producing the right sounds. In adults, apraxia usually happens after some kind of head trauma or a stroke. In children, it can be the result of trauma in infancy or there can be no reason for it. Adult Apraxia of Speech is usually permanent. Childhood Apraxia of Speech is overcome with speech therapy, hard work, and time. Apraxia can also show itself in a couple other ways, besides speech. JF had feeding therapy well before he ever had speech therapy because he didn't always swallow correctly. Chewing food and swallowing was something we had to work on with him. He also drooled a lot as a baby, toddler, and small child because he couldn't keep the saliva in his mouth like most of us do. Even today his face is the messiest of all his siblings after a meal. I have heard that some children have apraxic problems with other gross and fine motor skills (kicking, jumping, running, coloring) but we haven't noticed those things with JF. So that's what it is, why it happens, and what it looks like - now let's talk about what it's meant for my family. For starters, it has meant therapy and special ed. Because JF was a NICU baby who received cooling therapy he automatically qualified for Early Intervention in our state. As soon as he was discharged from the hospital we were making weekly or monthly appointments with a variety of specialists. In this way we were fortunate because his feeding / speech therapist was able to spot his difficulties much earlier than Travis and I would have ever considered there being a problem. In fact, for a long time we just thought he was a quiet kid. WRONG. JF is a silly, loud kid who couldn't speak. Once JF turned 3 he aged out of Early Intervention and began attending preschool in an Early Childhood Education classroom at the public school. Here his speech therapy went from one hour once a week to twenty minutes three times a week with extra emphasis on language throughout his school hours by all his teachers. His language began to burst. For most people he was still very hard to understand but those closest to him could now talk to him. It was wonderful! In that first year of school, when he was three, he often dropped the beginnings and sometimes the endings off words and only used about 1/5 of the words needed for a sentence but with context we knew what he was saying. JF also used a lot of signing and gesturing to help in his communicating. "Grandma, will you take me on a walk to the park now?" would be said, "Ama, walk 'wing?" with him pointing to himself and outside, then swinging his hand back and forth with "'wing" and finally pointing to the ground for "now." We were also able to get an iPad with Go Talk NOW to help James communicate. He took it to school each day and we used it around the home but he wasn't very motivated to use it and relied more on trying to say the words and gesturing. Another thing that helped JF was his siblings. They were often able to "translate" for us - no big deal. I also really believe that his younger sister helped him grow his vocabulary and sentence building. Eventually she would surpass JF, but for a long time Resa and he were progressing at the same rate and it was really beautiful to see how their friendship was helping them both. JF just finished his third year in Early Childhood Education. He has gone from having a profound speech delay to a low-moderate one. His language continues to improve and even strangers are able to understand him now. He sometimes has trouble controlling his volume, especially if he is excited or hurt but we notice him making gains each week. We don't know how long JF will need extra help but we know that at some point - third grade, eighth grade, sophomore year of high school - he will be fine and no one will ever know he had issues with his speech. If you or someone you know has a child with a childhood apraxia of speech diagnosis, there is hope. Your little one will find his voice, too. PS - I have found the Apraxia Kids website to be an incredibly useful tool. This is so helpful! We have a cousin with apraxia, and wondered if our daughter had it when we noticed her speech issues. She doesn't, but I was doing a ton of research there for a while. Something like this would have been so helpful! Thanks for sharing your son's story Bonnie. Even though I have heard of speech apraxia, I did not know exactly what it was. Thank you so much for sharing this, Bonnie! Both of my daughters were diagnosed as being a child with a developmental delay, and both have needed speech and physical therapy. My oldest just qualified out of it (met all her IEP goals!!! ), and I came to see all of their therapists as friends and advocates. But when they were both diagnosed (within a few months of each other) I felt so overwhelmed with their therapy schedules and so alone. Like your little guy, my girls won't need therapy forever (i.e. they don't have a permanent disability) so I felt like I couldn't put myself in the safe category as moms of little ones who have a disability, but I also felt like my friends who had kids without delays didn't understand. I had friends who just couldn't understand that we couldn't do playdates for a while because of the stress of keeping up with therapy. So preach it, sister! Mamas need to know they and their little ones aren't alone and -most importantly - it's not anyone's fault!!! Also feel like early childhood therapy affirmed for me what a blessing the public school system is, and what amazing and compassionate teachers work there. So glad JF is blessed with a mama who supports him so well in his growth and development! Good job, Mama! Yes. I know what you mean about keeping up with therapies. Our week was SO full - sometimes two appointments a day - when JF first came home from the hospital. And that lasted about the next 8 months. It is a lot. My kiddo has autism and was a preemie with global developmental delays so we're doing therapies for apraxia as well. Thank you for going into detail - it helps to see how other kids with therapies and IEP's grow and develop. My daughter has DS and with it speech delays. Like you, I've noticed how her siblings can tell exactly what she wants (with no verbal communication at all). We're hoping that her little brother (who's two to her three) will give her some extra stimulus to talk. It's hard, sometimes, now that he can use sentences and adjective, and she can only sign basic things. I will say she's a master of nonverbal communication. I hope James' speech continues to bloom. Good for her, for mastering sign and other nonberbals! That's excellent! Our 3-year-old nephew has what seems like very difficult speech problems. From your explanation, I think apraxia might be it. He is just starting to use some words, but is very difficult to understand and grunts a lot or points. It's startling and concerning for us, especially since our 2-year-old (exactly a year younger) has a huge vocabulary and won't stop talking, ever. So far, my in-laws haven't done speech therapy (I'm not even sure if they've looked for a diagnosis or anything). How can we lovingly approach this with them without offending or anything? I can't help believing that in his case it's not something that will just get better or go away without a lot of professional help. Thanks for any advice! I hope you check this - I tried finding an email address somewhere but couldn't and I am just now getting back here. Knowing that you may need to alter this a bit to fit your family, I think I would go about it a couple of ways. First, I might message / email the Apraxia Kids website to them and say something like, "I saw an article/ blog post that talked about a child'd speech and the author / blogger linked to this website. Have you ever heard of it?" Or I would wait for the next time I saw them. If there was a more private moment I would ask, "It's hard for me to understand X. Do you have any tips?" and then I would lead the conversation to one where you ask about if the doctor has said anything and mention the Apraxia Kids website or this blog post. I would actually prefer this way as a mom, but if you are really close than you could try either.